When selected as a “Green Talent” you will get the unique chance to visit German sustainability experts of your choice and discuss your current research with them. 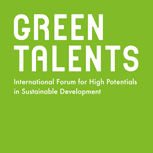 These individual appointments are an integral part of all Green Talents Science Forums. By providing the framework for presenting your research and for a personal exchange of ideas, they might lay the basis for collaborations with German experts and institutions. But first you need to identify relevant experts in your field of research. The experts you chose must be stationed in Germany but do not have to work at any of the institutions we will visit or be a member of the jury. You can nominate someone of your free choice while you should bear in mind that the individual appointments are supposed to help you find a host for your research stay next year (to read more about the research stays of previous Green Talents might also proof helpful in this regard). You should therefore consider someone from your own field of expertise and already think about what you would potentially discuss with them. Below you can find a list of institutions which awardees from previous years already visited for their individual appointments. On the right side you may also find webpages which help you to explore Germany’s diverse research landscape and to find the most suitable German expert for you.